While Farming is a common staple of games that lean towards the “euro” style of things, many consider that activity to be somewhat boring. After all, it’s a little bit like watching grass grow, only the final plants are taller. Perhaps Farming might be more interesting if there were explosions involved. Or at least some intense sabotage, theft, and destruction. Enter the card game Farmageddon, a game by friend-of-the-dragon Grant Rodiek, originally published via The Game Crafter but now available from 5th Street Games. Disclaimer: @futurewolfie’s name can be found in the credits of Farmageddon under “Graphic Design.” While he was involved as a freelancer, he did not participate in the design, development, or playtesting of the game, and has done his best to keep this review honest and objective. Farmageddon is a light card game that plays fast and furious. 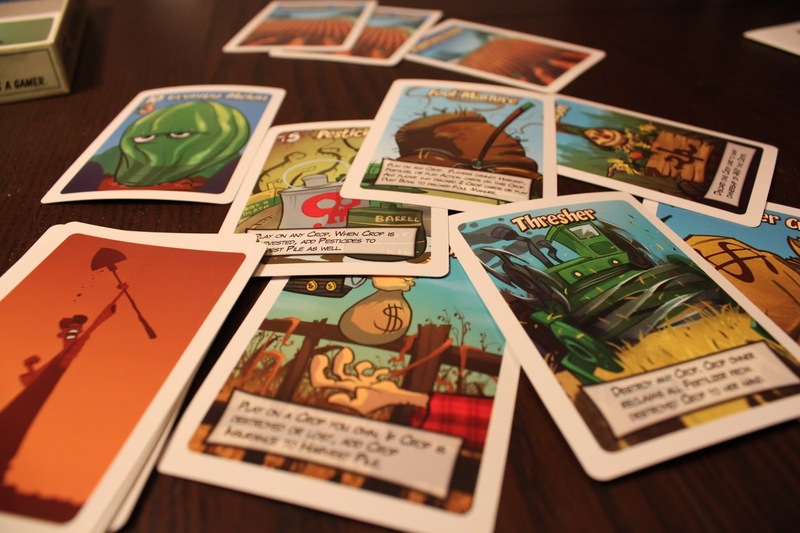 Players must plant crops and harvest them to earn the most cash before the deck runs out. Players take turns drawing Crop cards, planting cards and fertilizing them, playing action cards, and finally drawing action cards. Each Crop card (colorfully named and wonderfully illustrated) has a cash value and a fertilizer requirement. Players can harvest their own crops on their turn, but only if 1. the crop has fertilizer (which is simply crop cards played face down) equal to the requirement, and 2. the crop was not planted on the same turn. The catch with planting Crops is that there are only 3 planting fields available, which can be claimed by any players. Players also have Action cards, of which they can play up to 2 on their turn. These action cards are the heart of the game; through them, players can sabotage each others crops; destroy them, ruin their value, steal them, lock them down, invest in them, or a myriad of other activities to screw each other over. The game ends when the last crop card is drawn and the current player completes their turn, and the player with the most cash in harvested crops (taking into account bonus action cards and certain penalizing action cards) wins! Oh, there’s a mini-expansion included in the box thanks to a successful Kickstarter. 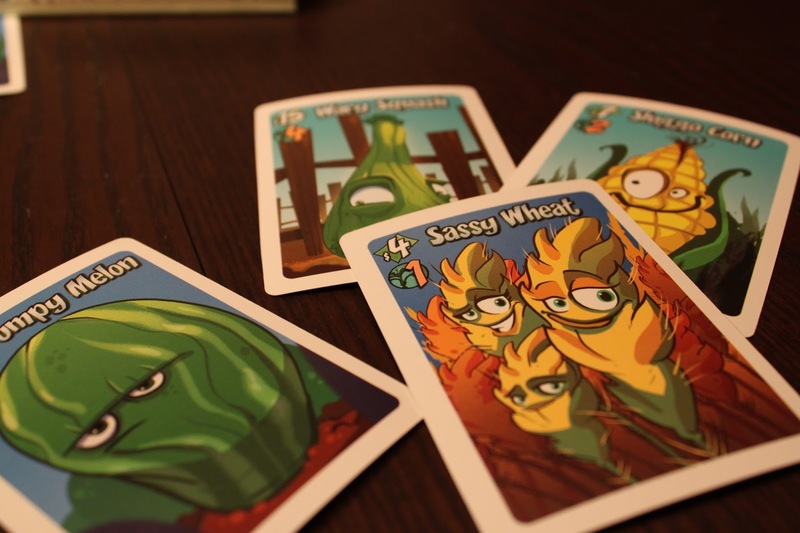 The “Frankencrops” are a mix of Crop card and Action card – they are planted as Crops and can be used as Fertilizer, but they also have special abilities that usually activate as soon as they are planted. Genetic Superworm or Foul Manure? Farmageddon is aptly named. Within this game you’ll definitely find rampant destruction, a free-for-all battle for survival, and a roller-coaster ride from start to finish. The question of whether or not you’ll enjoy the game depends mostly on whether or not you enjoy this sort of swingy, heavy on the take-that style of game. The nice thing is that the game does play fairly quickly. The box says 30 minutes, which is generally true, although the first few plays will definitely take longer. New players will need to read the cards, and as the game progresses you’ll have a lot of cards in hand to sort through and remind yourself what you have available. If you’re okay with “take-that” (perhaps we should do a guide on the subject; if you’re unfamiliar with what I mean by “take-that,” the simple summary is that players can steal from or sabotage the efforts of other players in significant ways. Best laid plans are easily thrown awry as the in-game interaction is fast and loose and explosive) sorts of games, Farmageddon does it pretty well. While it does seem possible to get stuck in a cycle – that is, say, player A plants crops, player B steals those crops, player C destroys them, player A can’t do anything else but plant crops – for the most part each player will get a chance to do some damage and score a few points, especially after getting a few plays under their belt. At the very least, you get plenty of cards in your hand, and while there is a card here and there that can take something away from your hand, you always have plenty of options. Do you play that low-scoring card and hope that everyone just ignores it, allowing you to inch your way steadily forward? Do you save your crops and wait til you can sabotage or steal someone elses? Do you play Foul Manure to protect your valuable crop, or do you pop it on someone elses to prevent them from scoring? Rarely will you be found without something to sabotage or destroy. It’s equal opportunity in its wanton destruction. The strangest thing I find about this game – mechanically at least – is a strange propagation of the most powerful action cards near the end of the game. While players draw Actions and Crops at the same rate, the action deck is much smaller than the Crop deck – perhaps around half the size – which means at a certain point, the action discard will get re-shuffled. Now this is fairly normal, but what’s affecting this strangely is the fact that you can only play 2 Action cards per turn – the same number you draw. At face value, the math adds up, but as you play you realize you aren’t going to play 2 Actions every turn. Sometimes you want to hold on to your cards til a more opportune moment; sometimes there’s just nothing on the table your cards can interact with. This, too, is acceptable – you want to have choices of when and where you play your cards to maximize your effect. The point is, drawing 2 cards but not always playing 2 – and no hand size limit – means that when the action cards get re-shuffled, the deck is a lot smaller. In my experience it continually gets smaller and at the end of the game, certain cards which are always good to play – like the Dust Bowl, which conveniently destroys all crops on the table unless protected by a Foul Manure – surface again and again, leaving other cards in the… pardon me for saying… dust. While this certainly increases the action as the game end nears, it’s sort of anticlimactic – rather than a mad rush of players attempting to score crops at the end, crops simply get wiped more and more often resulting in scores becoming more rare, more difficult to achieve. Not that this drags on for hours. This is only the last few turns of the game, mind you. But it’s there. It happens, at least to me. The other odd thing is the function of Fertilizer. Now mechanically it is spot on; you just use crop cards, placing them face down, to Fertilize your crops. This means you have to choose which crops to plant and which to use as Fertilizer. Do you try and plant that extremely valuable Wary Squash, worth $15? Or do you try and score something cheaper, in hopes that the other players will ignore it and go for someone elses Wary Squash? Yes, these choices exist and they’re the good ones. But on the other hand, crop cards aren’t exactly a scarcity unless you go planting willy-nilly, and you’re not limited to how many you play each turn as Fertilizer. This means there’s absolutely 0 reason to fertilize anything unless it can be harvested. Otherwise, you’re just fertilizing a thing that someone else is going to steal and harvest themselves. There is a rule that you must Fertilize once if possible, but it can be fairly easy to skirt that requirement. In any case, harvesting a Wary Squash with 4 Fertilizer is almost no more of an accomplishment than the single-fertilizer Sassy Wheat. If either of those makes it around one turn (or you managed to snag one from someone foolish enough to leave it unguarded), you’ll simply play your fertilizer and harvest immediately. There’s absolutely no reason to risk more than one turn around, and the status of crops is so uncertain it is always better to harvest what you can immediately rather than try to get something else in your hand. This is the whole “bird in the hand is worth two in the bush” parable, contained in card game format. What is unarguably fantastic about this game is the artwork. It is spot on, with charmingly emotive depictions of the crops and wonderful, detailed images of the action cards. The only complaint I have about the components in general, is that it can be a bit difficult to distinguish certain Action cards from Crop cards in your hand. There is no easy-to-see distinguishing mark to indicate a crop card versus an action card, which is especially troublesome with the Frankencrops in the mix. (Yes, you may realize, if you read the disclaimer above, that if I did the graphic design for this game, this lack of distinction is entirely my own fault. I told you I would try to be honest; we all make mistakes and this was one of my own). Speaking of Frankencrops, the rulebook recommends leaving them out for the first game, but if you have much gaming experience at all this probably won’t be necessary. You can add them in right away, and they’re a great addition. They give you a little more in the way of choice, with abilities that help you protect your crops or score them faster or, you know, mess with the other players a bit more. Adding them to the game does extend the length of the game at least a bit – the extra cards will add another round or two in and of themselves, but the Zombo-Weed will further increase this extension by sending a bunch of cards to the bottom of the Crop deck at some point during the game. However it’s definitely worth it as these crops are fun to play with and give you perhaps the teensiest bit more power over the outcome of the game. 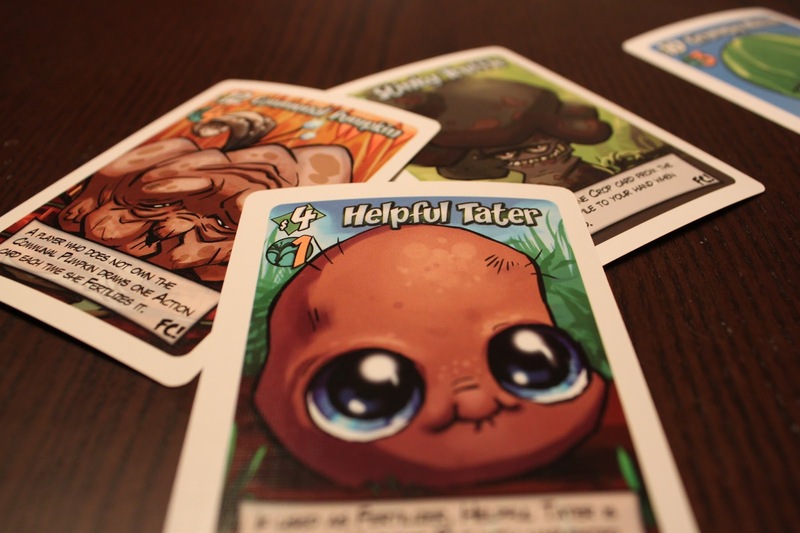 Farmageddon is through-and-through a highly interactive, take-that, in-your-face card game. It is beautifully illustrated and the card names and functions are clever and creative. There’s some amount of clunkyness (an extra page in the rulebook is dedicated to the “fertilizer” rule which can be confusing at first glance) and the progression of the game with the action card deck can get a little wonky. But it’s certainly quick and easy to learn, and it works just fine as an action-packed filler – the sort of game you play while waiting for everyone in the gaming group to show up for the meat of the night. If you’re into known quantities, carefully laid out plans, and efficient economic systems, this game is not for you. 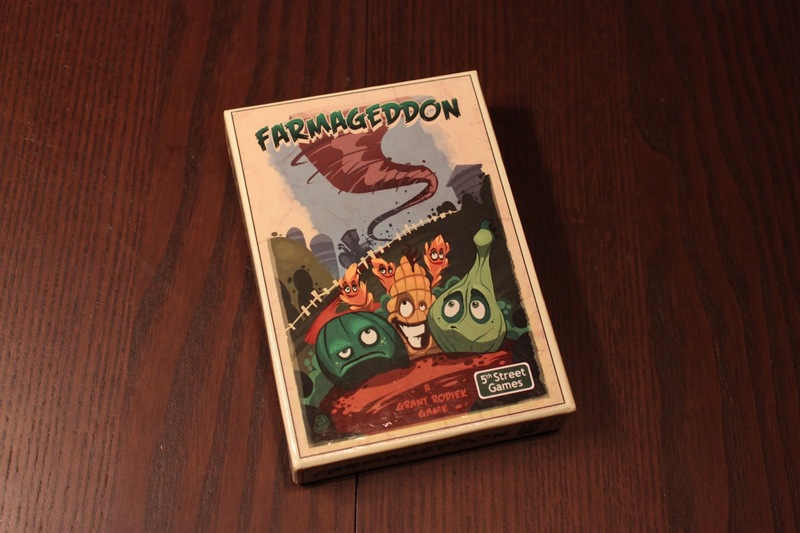 But if you’re looking for a little frenetic action, a quick little card game that is very portable (it’s what we around here call a “Lenny” – a game box small enough to fit easily in the pocket of some cargo pants or a jacket), Farmageddon might just hit the spot.